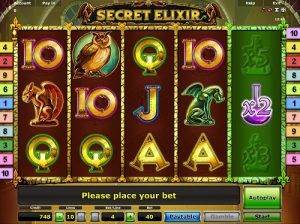 Secret Elixir slot game, brought to you by NovomaticCasino.co.uk, is one of Novomatic’s best and most lucrative slot games. When you load the game, you’ll be transported to a historical fantasy land and inside an apothecary! Bubbling potions will be boiling in flasks and condensing in tubes, and the scientist is hard at work mixing and making all sorts of different potions and elixirs. One of these potions, the secret elixir, has made its way on to the reels to help give you big wins by multiplying your wins! Fans of our other Novomatic slots, such as: Book of Ra Deluxe, Reel Attraction and Rumpel Wildspins will love this game. This 5-reel, 10-payline slot has more ways to win than you think! In order to get a payout, you’ll need to spin at least three matching symbols on an active payline, on consecutive reels from left to right. The size of each payout will depend on the winning combination of symbols as well as the size of your bet. You can change your bet amount by increasing or decreasing the number of lines you wish to bet on, as well as the amount you wish to bet on each line. You can check the paytable to see how much each combination will pay you according to your current bet. The lower-paying symbols in Novomatic’s Secret Elixir slot game are the card values from 10 to Ace. Then there is an owl, two gargoyles, a man in an apron, a woman in an apron and the scientist who makes the secret elixir himself! The fifth reel in Secret Elixir slot game is reserved only for the secret elixir itself. In the normal game, there are elixirs which multiply your wins by x2, x3 and x5, when they fall on an active payline. During the free games, the multipliers go up to x20! In order to get free games, you’ll need to spin three or more glowing, green gems to trigger 12 of them and with multipliers of up to x20, these can be super generous and lucrative! In both the normal game and in the free games, the potion-making scientist is the Wild symbols and he substitutes for all other symbols, except the Scatter which is the glowing, green gem. Having been developed by Novomatic, one of the top game providers out there, Secret Elixir has some classic Novomatic features, such as ‘autoplay’ and ‘gamble’. The autoplay function lets the reels spin themselves while you sit back, relax and watch as the wins happen before your eyes – no clicking necessary! The gamble feature allows you the opportunity to increase your wins! All you’ll need to do is guess between red and black as to the colour you think the next card will be – get it right and you’ll double your bet, with another chance to try again, but get it wrong and you’ll be back to the reels with nothing! Aside from our extensive selection of online slots, we also have the best table games and the best live casino games. Our live casino games are brought to you live and are of the highest-quality! You can play at a real table and get an authentic casino vibe from your own home! Imagining playing Live Poker, Live Blackjack, Live Baccarat or Live Roulette and winning a massive sum without even having to change out of your pyjamas? We also have a plentiful selection of mobile slot games for you to play while you’re out and about!